ORONO, Maine-- The University of Maine Black Bears men's hockey team fell in a close 1-0 contest against the Providence Friars on Friday night. In the first period, Jeremy Swayman tallied 12 saves for his squad. Maine had the first power play chance of night but was unable to capitalize on the odd man advantage. 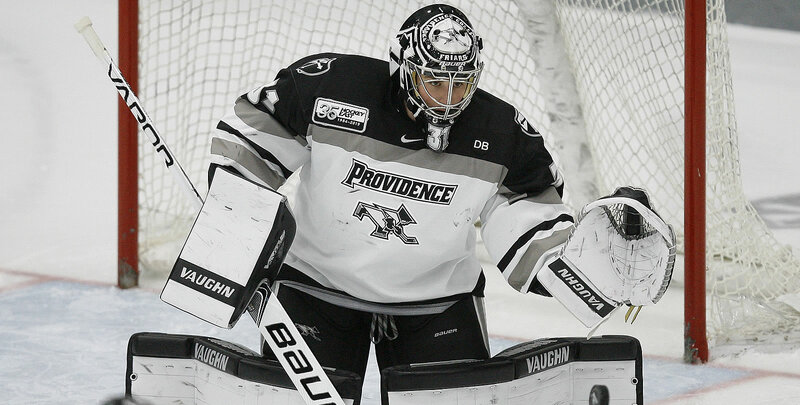 When it was the Black Bears' turn on the penalty kill, they allowed zero shots to the Friars. First Goal: Providence rushed in with two men on the near side boards, after Matt Koopman collected the puck and fired it in from inside his own blue line. Ryan Tait held it before sending off a short pass to Bryan Lemos as he came across and into the slot to fire a rising shot in for his third this year. Lemos' goal ended up being the only and game winning goal of the Hockey East contest. Maine will look to gather two points tomorrow when they host the Friars at 7:00 pm in the Alfond. -The Black Bears penalty kill was strong, going 3-for-3 on the night, with the defense blocking seven shots in front of him. -Maine posted 13 shots on goal in the third, nine more than they allowed the Friars in the final period. -Swayman earned tonight's first star honors for his stellar saves in the contest. -Maine is now 10-14-3 overall and 6-8-3 in Hockey East. The Black Bears will face off against Providence again on Saturday night, with puck drop scheduled for 7:00 pm.